On the eve of International Women’s Day in 2015, the Chinese government arrested five feminist activists and jailed them for thirty-seven days. The Feminist Five became a global cause célèbre, with Hillary Clinton speaking out on their behalf and activists inundating social media with #FreetheFive messages. But the Five are only symbols of a much larger feminist movement of civil rights lawyers, labor activists, performance artists, and online warriors prompting an unprecedented awakening among China’s educated, urban women. In Betraying Big Brother, journalist and scholar Leta Hong Fincher argues that the popular, broad-based movement poses the greatest challenge to China’s authoritarian regime today. 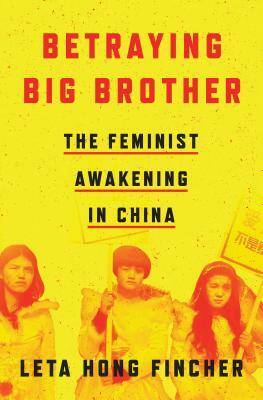 Through interviews with the Feminist Five and other leading Chinese activists, Hong Fincher illuminates both the difficulties they face and their “joy of betraying Big Brother,” as one of the Feminist Five wrote of the defiance she felt during her detention. Tracing the rise of a new feminist consciousness now finding expression through the #MeToo movement, and describing how the Communist regime has suppressed the history of its own feminist struggles, Betraying Big Brother is a story of how the movement against patriarchy could reconfigure China and the world. Leta Hong Fincher is a journalist and scholar who has written for the New York Times, Washington Post, Guardian, Ms. Magazine, the BBC and CNN. She is the author of Leftover Women: The Resurgence of Gender Inequality in China.